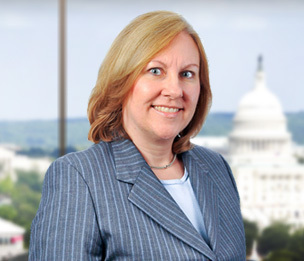 Terri S. Reiskin is the Practice Group Leader for the Products, Class Actions & Professional Liability Practice Group. Ms. Reiskin is a litigator with extensive national experience handling product liability litigation, class action defense, consumer finance, appeals, and other complex litigation. Ms. Reiskin’s product liability experience has involved a variety of products, including automobiles, trucks, pharmaceuticals, food products, and medical devices, including hip implants, breast implants, bone screws, latex gloves and pacemakers. She is recognized as a leading class action defense lawyer at both the trial and appellate level. Her class action experience includes cases alleging consumer fraud and other causes of action in courts around the country relating to products as varied as automobiles and lacrosse helmets. She has also defended Fair Debt Collection Practices Act and Telephone Consumer Protection Act class actions. She has served as lead MDL counsel, national and regional counsel, and as first-chair trial and appellate counsel. Following law school, Ms. Reiskin served as a judicial clerk to the Hon. Thomas Penfield Jackson on the U.S. District Court for the District of Columbia. Before joining Dykema, she was a partner in a major, international law firm and was part owner and partner in a small litigation boutique. Lead MDL counsel for a major automobile manufacturer in litigation relating to Takata airbag inflator ruptures. Lead counsel in numerous product-based class actions against automobile manufacturers and suppliers. National and regional counsel to a major U.S. automobile manufacturer in product liability litigation. National coordinating counsel on preemption issues for a major US automobile manufacturer. Lead counsel in defense of Telephone Consumer Protection Act and FDCPA class actions. National coordinating counsel to a fast food chain for hot coffee litigation. First chair trial counsel in individual product liability and class action cases. Numerous medical device cases involving silicone gel breast implants, bone screws, latex gloves, pacemakers, knee implants and hip implants. Non-litigation counseling of clients on class action and product liability issues, including pre-marketing and warnings. Appellate counsel in product liability cases, including briefing and oral argument in state and federal courts nationwide. Lead counsel in hundreds of individual product liability cases. Author of amicus briefs in the U.S. Supreme Court and state appellate courts. Other experience includes defense of numerous medical malpractice suits, environmental and insurance coverage cases. In re Ford Tailgate Litigation, 2015 U.S. Dist. LEXIS 159534 (Nov. 25, 2015) (granting summary judgment and Daubert motions to exclude four plaintiffs’ experts; denying motion for class certification as moot). In re Ford Tailgate Litigation, 2014 WL 1007066 (N.D. Cal. Mar. 12, 2014) (granting partial motion to dismiss class action). In re Ford Tailgate Litigation, 2014 WL 3899545 (N.D. Cal. Aug. 8, 2014) (granting partial motion to dismiss). Davisson v. Ford Motor Company, 2014 WL 4377792 (S.D. Ohio Sept. 3, 2014) (granting motion to dismiss multi-state class action without leave to amend). Marsikian v. Mercedes-Benz USA, LLC, 2009 U.S. Dist. LEXIS 117012 (C.D. Cal. May 4, 2009) (granting in part motion to dismiss class action involving alleged defect in air-intake system). Anchia v. DaimlerChrysler AG, 230 S.W.3d 493 (Tex. Ct. App. July 23, 2007) (affirming trial court ruling regarding lack of personal jurisdiction over foreign parent corporation). Terry v. Mercedes-Benz USA, LLC, 2007 Tex. App. LEXIS 5601 (July 18, 2007) (affirming summary judgment in putative class action involving alleged bumper defect). Coker v. DaimlerChrysler Corp., 2004 WL 32676 (N.C. Super. Jan. 5, 2004, aff'd.) (dismissing no-injury class action under N.C. unfair trade practices statute based on lack of standing, economic loss rule and primary jurisdiction doctrine putative class action). O'Keefe v. Mercedes-Benz USA, LLC, 214 F.R.D. 266 (E.D. Pa. 2003). (approving class action settlement of case involving alleged engine problems due to use of non-synthetic oil). Ziegelmann v. DaimlerChrysler Corp., 649 N.W. 2d 556 (N.D. 2002). (affirming summary judgment in no-injury class action involving lack of brake-shift-interlock devices). Cooper v. Smith & Nephew, Inc., 259 F.3d 194 (4th Cir. 2001). (affirming summary judgment based on successful Daubert motion in bone screw case). Christian v. Minnesota Mining & Mfg. Co., 126 F. Supp.2d 951 (D. Md. 2001). (granting summary judgment in breast implant case). Boyle v. Chrysler Corp., 501 N.W.2d 865 (Wis. App. 1993). (finding no air bag claim preempted). Gatewood v. Washington Healthcare Corp., 933 F.2d 1037 (D.C. Cir. 1991). (affirming dismissal of case under the Emergency Medical Treatment and Active Labor Act). Young v. Sherwin-Williams Co., Inc., 569 A.2d 1173 (D.C. 1990). (affirming summary judgment applying professional rescuer doctrine). Recognized by Who's Who Legal, 2010-2011, 2018. Copyright 1998-2012 Law Business Research Limited.